What issues are Calvin students facing outside of the classroom? 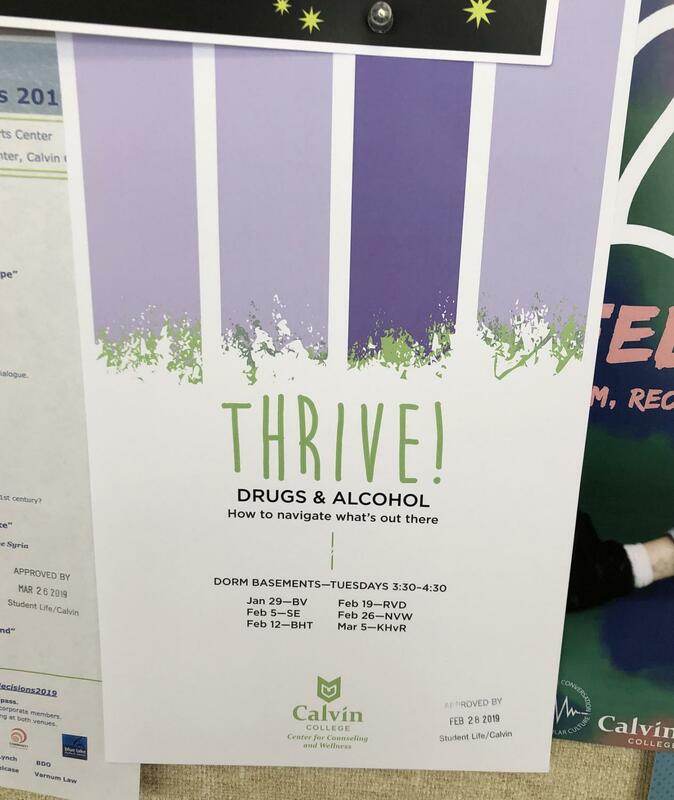 The Center for Counseling and Wellness (CCW) is trying to address that this school year with the ongoing Thrive workshop series, which focuses on interactive skillbuilding to help equip Calvin students with the tools to deal with relevant topics in their lives. Starting with stress management and relationship workshops last semester, the Thrive series is now addressing drugs and alcohol. “We feel it’s important for all students to understand the impact of drugs and alcohol, not only to help them avoid unhealthful behaviors, but to also give them some ideas on how to intervene if they are worried about a friend’s behaviors,” explained Becki Simpson, director of residence life. As a partnership between Residence Life and the CCW, Thrive is unique as it takes place in the dorms, though it is open to students on and off-campus. Thrive sessions occur in dorm basements Tuesdays 3:30–4:30 p.m., and two have already taken place in BV and SE. Upcoming sessions will take place in BHT on Feb. 12, RVD on Feb. 19, NVW on Feb. 26, and KHvR on March 5.